Chewable Kiddievite™, the great chewable vitamin and mineral supplement! 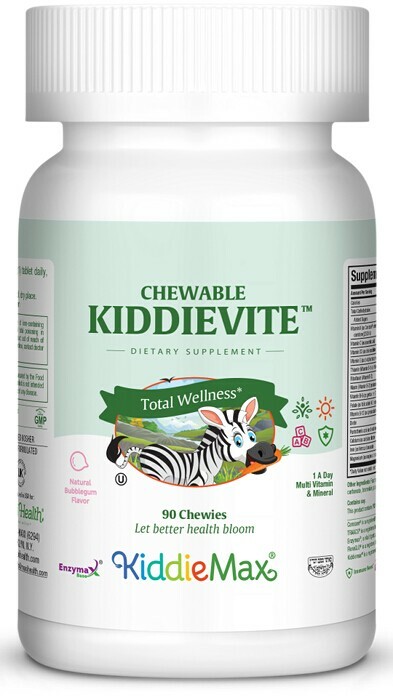 Chewable Kiddievite™ contains 30 nutritional ingredients from whole foods, vitamins, minerals, and amino acids which are essential for childhood growth and development after their first birthday. Click on the supplement facts and see for yourself! Eating wholesome foods (fresh vegetables, fresh fruit, whole grains, etc.) may be the optimal way for your children to get the necessary nutrients, but alas, it’s not always possible. Children in their toddler and preschool years are picky eaters with changing tastes. We live in an age of highly processed foods. Even our fruits and vegetables are often grown using techniques that minimize the vitamin and mineral content. Giving children a multivitamin is beneficial to support their growth and health. In an ideal world there are a lot of plant and fruit derived supplements that you would feed your children, but would they eat it Chewable Kiddievite includes Barley Grass, Broccoli powder, Carrot powder, Citrus Bioflavonoid, Lecithin (from soybeans), Biolut™ marigold flowers extract, Biolut™ Marigold flowers extract, Trans-zeaxanthin, Papaya fruit powder, and Spinach powder. Chewable Kiddievite™ is available in delicious tasting natural bubble gum flavor. Here’s some great news, they contain no artificial colors or flavors! Give your little ones optimal nutrition and yourself peace of mind. Get delicious tasting Chewable Kiddievite™! Other Ingredients: Fructose, vegetable stearine, natural bubble gum flavor, silica, vegetable stearate, sucralose, Enzymax® (calcium carbonate, bromelain, papain, lipase, amylase, protease, silica). My brother used to get sick every 4 to 6 weeks. He was given Yummie Oraldophilus, Maxi Cleanse and Chewable Kiddievite. We saw great improvement. My 7 year old suffered from sensitive lungs. A pulmonary specialist perscirbed the drug Albuteral but we tried Maxi Health Kiddievite, Panto C, and Kiddie Boost instead. After 6 months, there is barely a cough! I love your vitamins. I feel so much better after taking them. Your Kyolic, Kiddievite, Maxi Omega 3, and Panto C.